Basically all I have been doing the past two weeks have been cleaning and re-arranging my new studio, studying for the GRE, and rocking back and forth while sobbing. Except ignore that last point. That point definitely is a lie. Who even said that?! General disclaimer: this is the stupidest and also most image-heavy post. 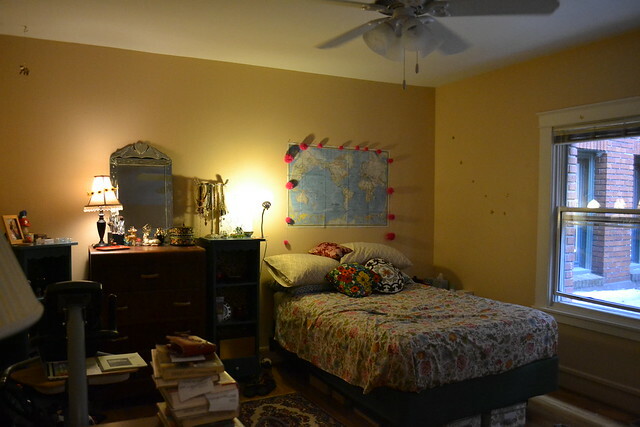 I MEAN, UH, I know y’all are just dying to see photos of my new apartment, so here you go, I will take you on a tour. Wow. Isn’t it just amazing? There are my scarves on the outside line of the door and you can see my really trendy shower curtain. Yeah, it’s currently for sale at Target for like $20. But I got it at Goodwill for $3. Yeah. I am the coolest. Also it’s a metro map of London so if you are ever lost in London just call me and I’ll get in the shower and help you figure out where you need to go. I know, I know, I’m so giving. Yeah dudes! 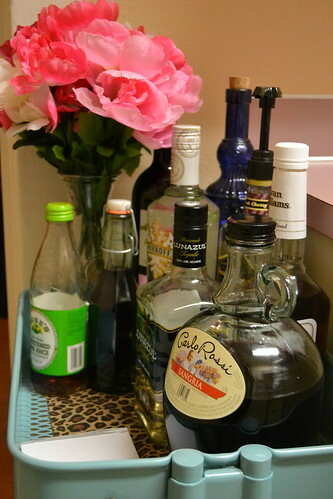 I have a lot of hair flowers. I don’t really know why, actually. I don’t wear them that often. But they are pretty cool. I feel fancy when I wear them. This is how I store them. It kind of reminds me of those flower garlands they put on horses after they win races, you know? Like, that horse doesn’t have any idea he won that race until they put that big flower garland around his neck… and then he knows he is king of the horses. Oh, also, that’s right across from my toilet. I didn’t take a photo of it, I figure, you’ve seen at least one in your lifetime. I did have to stand on my tiptoes to get a good photo of that garland though. I did that for you. I don’t own a couch, so this is also where I watch Netflix, eat, and read books. 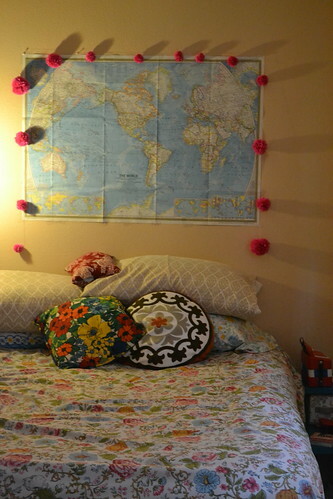 Sorry guys, I just can’t help being kind of pinteresty. It is a little bit me wanting to be trendy and also just how I operate. What? You have shingles you don’t want?! GIVE THEM TO ME I WILL PAINT FOXES ON THEM. Sweet, right? The dresser is on permanent loan from the awesome folks who took me camping in May and I am totally in love with it. 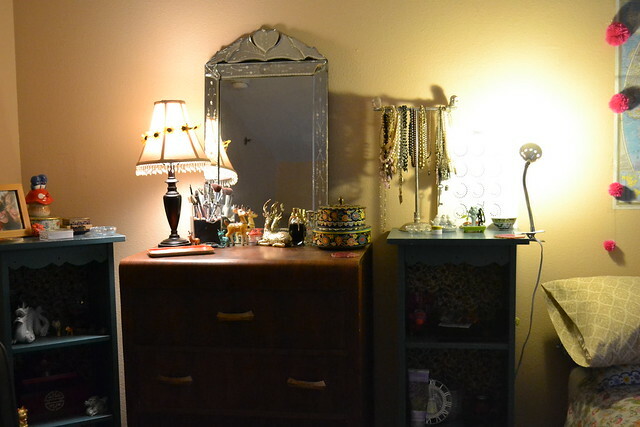 It’s a 1930s waterfall style dresser and it’s just so beautiful! 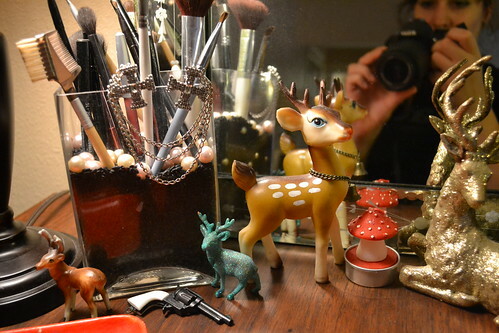 I found the mirror that’s on top of it at goodwill last week for $10 and really it was a match made in heaven. I just moved all of my makeup out of the shoebox I’ve been using and into the top drawer and so far it is a pretty boss setup. This is an unreasonably close up shot. Also hiiiii. Look. Look at my things. I have a lot of things. 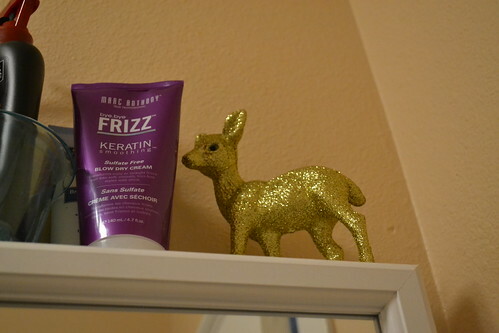 Deer and sparkly deer and also a toy gun. 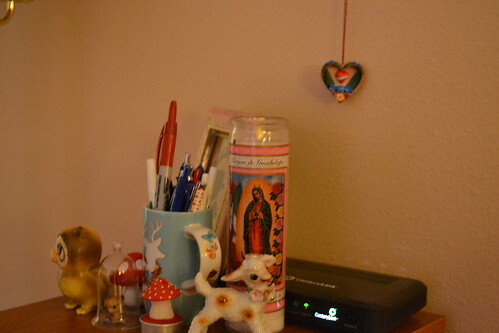 Pictured: My stupid lamb, deer in a glass jar and also the source of all lolcat photos. This is the entry to my apartment. 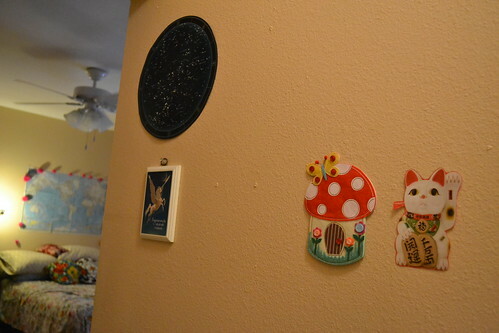 I want this wall to be a collage wall, but I’m not sure if I like what I’ve got so far. I need more framed things. 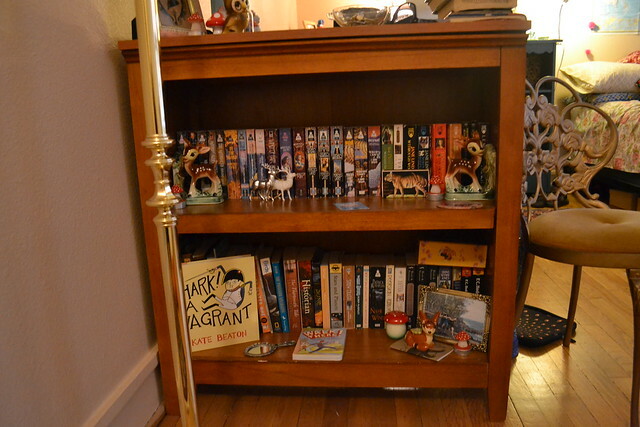 Pictured: a ton of Mercedes Lackey books, deer figurines, mushrooms, Nona’s vanity chair. I HAVE A KITCHEN YOU GUYS. IT IS PRETTY ADORABLE AND LITTLE. 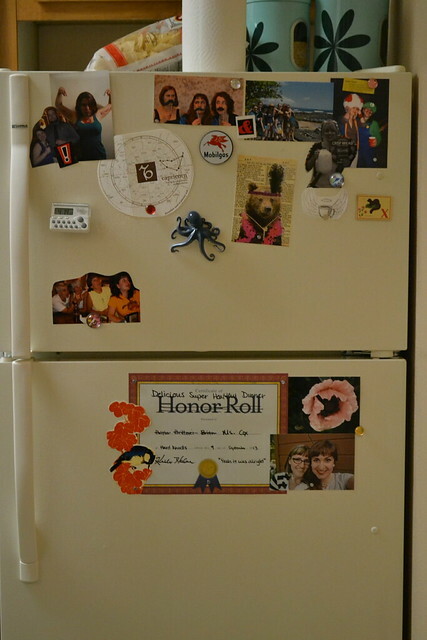 My fridge is pretty decorated. I am on the Honor Roll Super Delicious Healthy Dinner Roll, did you know that? 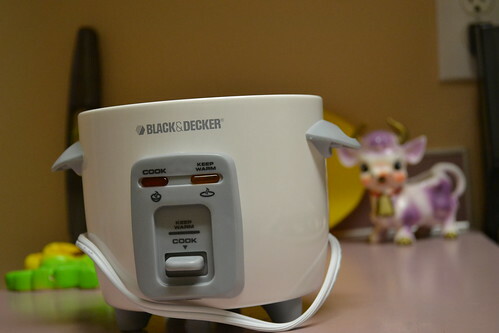 This is my teeny tiny rice cooker, Egbert. He only makes 2 cups of rice. Things I did not photograph: my closets, my ceiling fan, my foam roller, my laptop, my camera, my single full sized chair, my rugs, my wood floors, my stove, my dishwasher, my feet, my exercise bike. But really, this is all you need to see! The important things! Like my rice cooker. 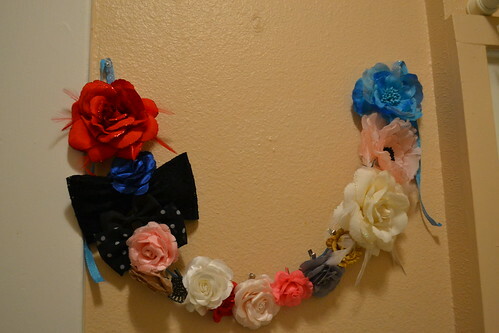 And my flower garland. It’s my place, and it’s pretty great. It looks so comfy! 🙂 Also you need to tell me if you like Pandemonium! 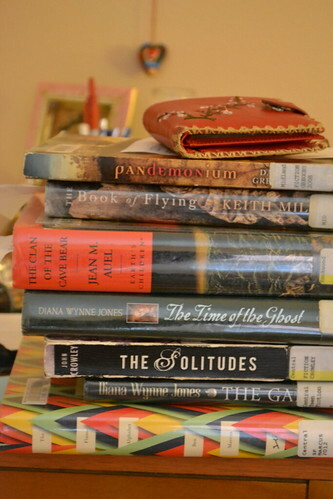 I haven’t checked a book out from the library since they started refurbishing the Shute Park building. Thanks Liz! I’ll have to have you over sometime soon. Pandemonium was VERY VERY GOOD! I am not sure if you will like it–it’s about demon possession. But it was a very well written and fun modern fantasy novel. Awesome apartment BC. 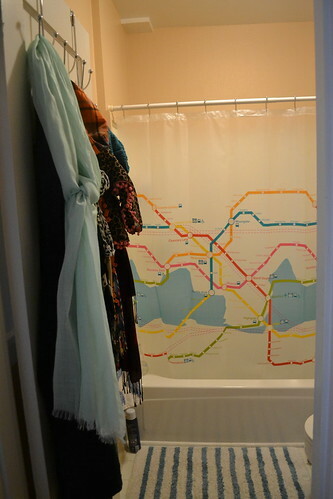 We love it and we NEED you shower curtain. We are totally jealous and have been lost there before. Oh!! Hi Guys!! Thank you!! And I’m very sorry but you can’t have my shower curtain.